Viewing Laguna Art Museum’s “Tony DeLap: A Retrospective” is like being in the audience of a magic act. Not because of the repetitious images of floating ladies and card tricks placed throughout the show. Not even because the artist has been an actual magician most of his life. Rather, it’s because, as with any decent illusionist, DeLap is either misdirecting your eye or making you think you’re seeing something you’re not. In the exhibition, as well as the extraordinary book accompanying the show, guest curator Peter Frank has picked some of the very best examples of the 91-year-old Orange County artist’s work, beginning with assemblages dating from the early 1960s. The mixed-media pieces hang opposite a gallery wall filled with preparatory and after-project sketches, and while they’re the most modest work in the exhibition, they’re also eye-catching in ways that some of the bigger, more recent paintings aren’t. Darkly mysterious little objects made of indistinguishable things you might stumble across on the street, almost dioramic in their use of depth. Found metal, daubed paint, something familiar, yet unexplainable, placed inside a frame in a way that suggests randomness, but feels carefully planned. In another gallery, the impressively Zen Untitled (Bendo)’s wood and pigment balances on a steel peg. Against the size of the gallery wall, the 1972 sculpture droops slightly downward, a katana in its display stand, its serene philosophical beauty a heady mix reminiscent of Swedish furniture aesthetic (without the flimsiness) and Japanese culture. In Floating Lady II, a winking tip of the hat to the age-old levitation trick, a long wooden beam balances on two sheets of glass clamped together in a V shape with metal braces. As with the classic magic hoodwink, the precariousness of the piece gives off both the thrill of potential danger and a sense of wonderment. Following in the vein of visual sleight-of-hand, I was impressed by the oversized, shiny, green and yellow strips of steel that made up Modern Times II and Triple Trouble II, but even more so when I found out that DeLap had dazzled and deceived both my eyes and my mind. What looks like painted metal was actually just heated plastic, fiberglass and wood. While critics puzzle over whether DeLap’s work is minimalism, abstraction, finish fetish or optical art, painting or sculpture, the artist has stated publicly that he simply embraces the complicated puzzles he creates for himself. Definitions don’t really matter. If we’re going to label this craftsman of so many diverse styles, this intellectual, influential maverick, we’re just putting him into a box he would escape from, anyway. 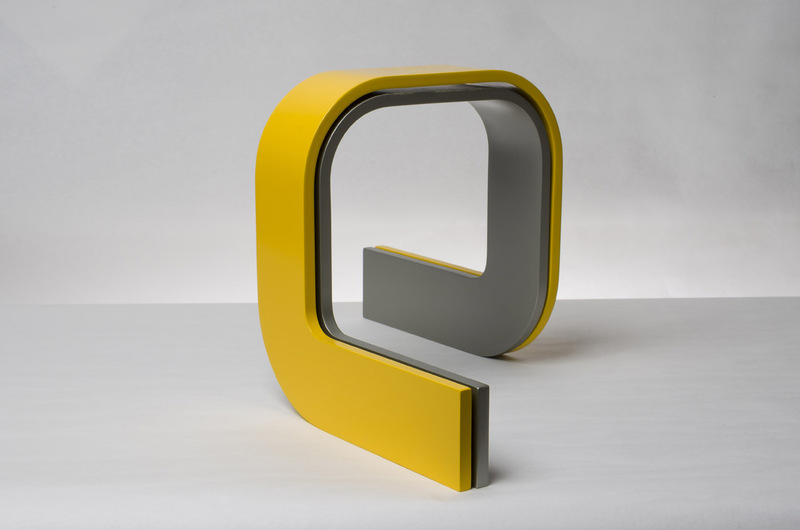 “Tony DeLap: A Retrospective” at Laguna Art Museum, 307 Cliff Dr., Laguna Beach, (949) 494-8971; lagunaartmuseum.org. Open Sun.-Tues. & Fri.-Sat., 11 a.m.-5 p.m.; Thurs., 11 a.m.-9 p.m. Through May 28. $5-$7; children, free. I had to wait about half an hour in the lobby before entering the Nicholas & Lee Begovich Gallery to see “Reclaimed Landscapes: The Art of Jarod Charzewski.” Sections of the thousands of pounds of stacked clothing in the installation had begun to “slide” like hills after a torrential rain, as interns gathered inside, quickly refolding and reapplying piles of used clothing that had slipped and sunk from their intended spaces. Once inside, that repair appeared to have been an act of hands-on conservation, with Charzewski’s carefully laid-out landscapes once again pristine. Intelligently co-curated by Danielle Clark and Jennifer Minasian, the installation was a rainbow-layered heaven of geologic cross-section, with textures and surfaces that cried out for closer examination and touch: the furry plush of a sweater becomes an animal’s coat; the tread of a bicycle tire the ruined ground after an ATV; the center conductors and braids of coaxial cables the mouths and tongues of snakes. Earth, water, even rock formations are suggested by the discarded objects (all graciously donated by Goodwill of Orange, Jax Bicycle Center and Duste Goods). Collected, unpacked and sorted by almost 100 volunteers over 500 hours, the massive undertaking is an activist’s call to action. Revelatory of Clark and Minasian’s skills at getting people to care about the same things they do, Charzewski’s upcycling vision for art also has a clarity and passion that’s focused and inspiring. 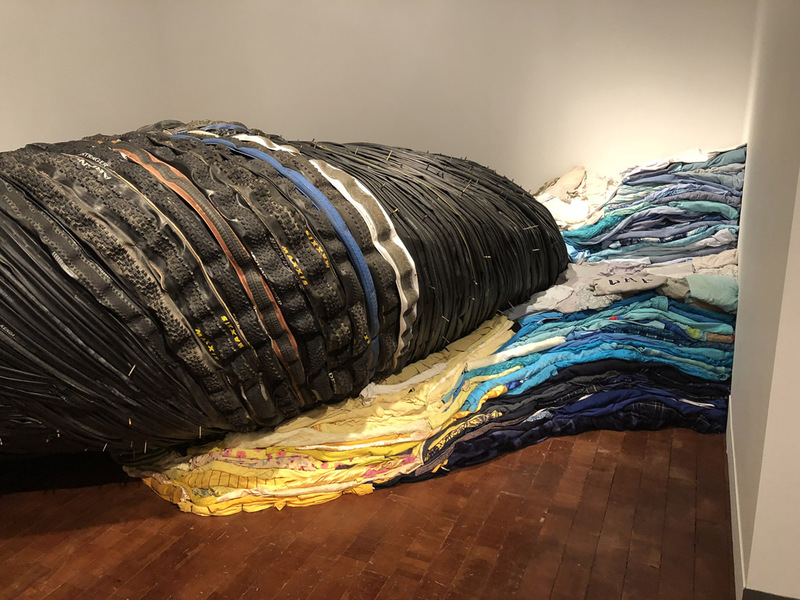 His art asks us to re-examine our ideas about reuse, consumerism, planned obsolescence and waste, while still gently reminding us of why those issues matter. That he has replicated our complicated environment with thrift-store cast-offs and garbage is not only a sweet irony, but also a warning to heed the landfills that take decades to degrade, the oceans filled with plastic, the polluted atmosphere and the already-spoiled terrain. All of the things so far that we haven’t loved enough to protect. “Reclaimed Landscapes: The Art of Jarod Charzewski” at Nicholas & Lee Begovich Gallery, Cal State Fullerton, 800 N. State College Blvd., Fullerton; www.fullerton.edu/arts/art/galleries/begovich_gallery/reclaimed_detail.php. Open Mon.-Thurs. & Sat., noon-4 p.m. Through May 17. Free; parking is steep during the week, but free on Saturdays.